1. Put the egg in a saucepan of cold water to cover it fully, bring it to the boil, turn off the gas, then cover the pan and leave it for 10 minutes. After 10 minutes, put the egg in cold water and leave to cool. Peel it when you can, and chop it up finely. 2. Season the trout fillets with pepper. 3. Heat up a small saucepan and put the tablespoon of butter in it over medium heat. When the butter starts to foam, add the chopped eggs, lemon juice and the stock. Bring to a gentle boil, stirring well, then letter it simmer for a couple of minutes to thicken it. 4. In the meantime, heat 1 tbsp olive oil in a frying pan large enough to fit the fish fillets comfortably. When the oil is hot, place the fillets in the frying pan, skin side down. (The hot oil may spit, so be careful). 5. Let the fish cook undisturbed for 2-3 minutes over high heat to crisp the skin. Then reduce the heat to medium and carefully turn the fish over. Let it cook for 2-3 minutes again (depending on the thickness of the fillets). The fish is done when the flesh is opaque all the way through in the thickest part of the fillets (check with a knife), and separates into flakes. 6. While the fish is cooking, add the creme fraiche to the egg mixture along with the Worcestershire sauce and chopped parsley. Stir it in well, turning up the heat if the sauce needs to thicken a bit more. 7. 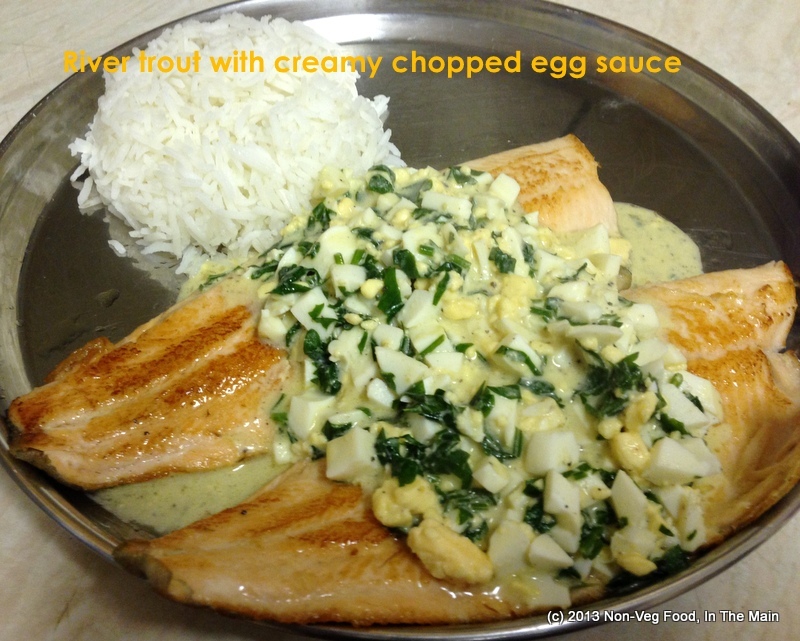 Serve the fillets hot with the egg sauce spooned over the top, with a side of plain steamed rice. Verdict: Pete said that while it would never have occurred to him to try an egg sauce with pan-fried fish, the combination worked surprisingly well. All in all, a unique recipe well worth keeping.